When you think of skincare products for oily, acne-prone skin, moisturizers probably aren’t at the top of your list. After all, doesn’t using a moisturizer mean more pimples, more clogged pores, and annoying oily shine? 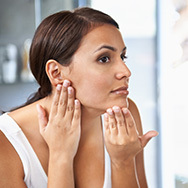 Given these concerns, it’s understandable to worry that applying a cream or lotion could make matters worse, but there’s a no-risk way to hydrate, even if you have acne-prone skin. Hydrated skin is healthy skin, even if you’re prone to breakouts and oily skin. Moisturizers aren’t limited to thicker textures; there are lightweight options that will smooth and soothe skin without clogging pores. SKIN BALANCING Invisible Finish Moisture Gel – A skin-refreshing, weightless hydrator that makes skin visibly softer and smoother while protecting it against signs of flaky, dehydrated skin. SKIN BALANCING Ultra-Sheer Daily Defense Broad Spectrum SPF 30 – Those with oily, acne-prone skin often skip sunscreen, worrying that thicker formulas can clog pores. But sun damage hurts everyone’s skin, so it’s critical to wear SPF every day. This remarkably light, fluid lotion formula defends against the sun’s rays while keeping excess shine in check. CALM Redness Relief Moisturizer for Normal to Oily Skin provides feather-light cream-gel hydration to lessen the signs of aging, while calming the appearance of redness and sensitivity. CALM Redness Relief SPF 30 Mineral Moisturizer for Normal to Oily Skin – A lightweight, soft matte finish moisturizer with sunscreen that soothes sensitive skin while still providing powerful yet gentle protection. RESIST Super-Light Wrinkle Defense SPF 30 – An age-fighting, pore-smoothing formula that protects against the sun’s rays with pure mineral zinc oxide sunscreen and a light tint that keeps it from having a white cast. CLEAR Oil-Free Moisturizer – This sheer, ceramide-infused lotion features pore-minimizing niacinamide and antioxidants to soothe redness without causing breakouts. CLEAR Ultra-Light Daily Hydrating Fluid SPF 30+ – This water-light liquid sunscreen alleviates areas of dryness and flaking without feeling the least bit slick, greasy, or suffocating.